The Royal Bath & West of England Society is delighted to announce that The Earl and Countess Bathurst are joint Society Presidents for 2018/2019. 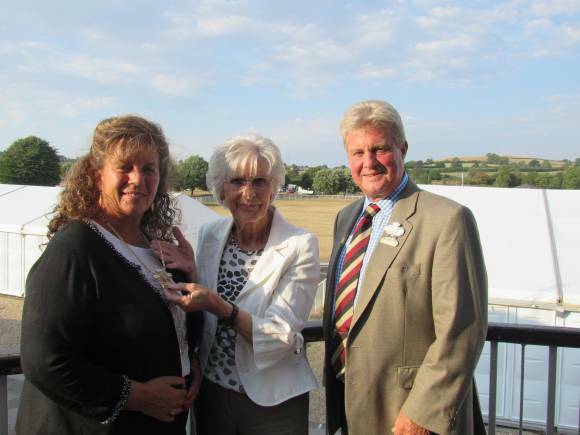 Taking up the baton from outgoing president, Mrs Mary Prior CVO MBE, The Earl and Countess were sworn in at a meeting of the Society Council at the Bath & West Showground on Thursday 26 July 2018. Handing over the badge of office, Mrs Prior said ‘It has been the most enormous privilege to serve as President during the past year and I have enjoyed it immensely. The Dairy Show was a delight and Grassland UK in May was spectacular, where I particularly enjoyed watching the amazing equipment being so skilfully deployed. The opening of the Rural Enterprise Centre was an exciting event and I wish this development every success for the future. I also loved watching the schoolchildren so well engaged on the Field to Food day. ‘The highlight was, of course, the Royal Bath & West Show. My husband and I loved staying on the Showground for the 4 days, which made us feel that we were really at the heart of this amazing world class event. ‘My warmest thanks go to the Trustees and to all the staff at the Society for everything they did to make us so welcome and I also wish to congratulate them on the hard work they do throughout the year. Enormous thanks must also go to the Volunteer Stewards who amused, entertained and educated us in equal measure. They were without exception hugely informative and we certainly learnt a lot. A personal thank you also to Colin Johnston the Archivist, who very kindly tracked down that my Father won 3rd Prize for his Friesian Bull at the 1936 Show! The Earl and Countess Bathurst join an esteemed line of Society Presidents stretching back to 1852. Recent times have seen such figures as Michael Eavis, Lord & Lady Fellowes, HRH The Countess of Wessex and Lord King of Bridgwater donning the mantle. Looking forward to their year in office The Earl and Countess said ‘We are hugely looking forward to our joint presidency, as old friends of the Royal Bath & West Show we have a great affection for the Society. ‘Mary has achieved so much in her year and we are grateful to her and the Directors for their guidance and support’.